The 5 luxury log cabins at The Thomas Lord are a perfect choice if you're wanting to do some fishing, walking or are just visiting the picturesque county of Hampshire. 1 king-size bed, sleeping 2 people. 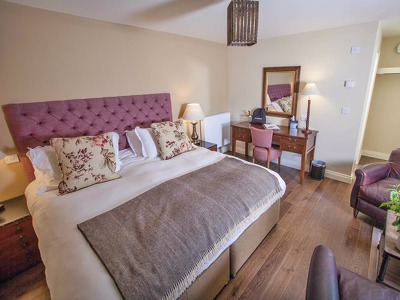 Each of the Deluxe Double Rooms is a luxury cabin in the grounds. They have a luxury en-suite bathroom with shower, king-size beds, and double doors leading into the stunning grounds. One of the sets of cabins are interconnecting, an ideal choice for families. Anne Semonin products are provided in each room. The charming village of West Meon in Hampshire is home to The Thomas Lord, a traditional, recently renovated village pub with 5 luxury wood cabins. The delicious British food, served 7 days a week, is complemented by a fantastic selection of real ales, wines and spirits. This is a friendly place to come for a mid-week or weekend break. The village of West Meon in Hampshire is close to the historic town of Petersfield and home to The Thomas Lord. With easy access from the M3, it's not far from the stunning city of Winchester and you can explore the surrounding countryside and rolling hills on foot or by bike year-round. In September each year, The West Meon Music Festival attracts world-class musicians. It takes place at St John the Evangelist Church where informal concerts are held over the weekend. It's a must for all music lovers. It's difficult to beat The Thomas Lord's recipe of mouth-watering food at a great price. The friendly and impeccable service is more akin to that of a boutique hotel than a traditional village pub. A well-stocked bar of spirits, wines and real ales makes it the perfect pub. Take the A31 Petersfield Road out of Winchester. Then turn slight left onto A272. After 10 miles turn right onto A32 and follow into West Meon. The pub is sign posted. Take the M3 out of London. At Jct 4, take A331 exit to Guildford/Farnham/Camberley/Farnborough/Aldershot. At the roundabout, take the 2nd exit onto the A31 in the Winchester/Farnham direction. Merge onto Guildford Rd/A31. In 13 miles, take the 2nd exit onto the A32. Follow for 9.8miles into West Meon. Take Botley Rd/B3035. At the roundabout after 3 miles, take the first exit onto the B2177. At the next roundabout after 0.2 miles, take the 4th exit onto the B3035. At the roundabout after 4.5 miles, take the 1st exit onto Warnford Rd/A32. Follow the A32 for 3.6 miles into West Meon. Take the M275 out of Portsmouth. At Jct 12, exit towards Southampton/Fareham. Merge onto M27. At Jct 10, exit onto Wickham Rd/A32 toward Alton. Follow A32 for 12.7 miles into West Meon. Southampton airport is 45 minutes away by car (30 km). 100% of the total price will be taken at the time of booking. If a cancellation is made within 2 days of the arrival date, or in the case of a no-show, 100% of the total price will be charged.